I wanted to make a version for my Wiz Kids to use which would not use a standard magic box approach like most of the above variations. I wanted it to have a lot of crazy gadgets, like my O.O.P.S. Machine. I wanted it to appear to have real water, without the mess. I wanted bubbles. I wanted to be able to wash and transform articles of clothing donated by the audience. I wanted it to be capable of flexible routining, not tied to any of the more traditional magic laundry routines. 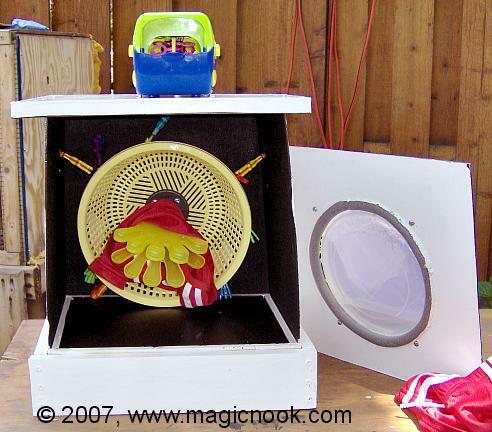 You could probably take any of the routines from the earlier Magic Laundry sketches and incorporate them using my machine. And you are free to add your own bits and make it even wilder and slap-happier than the Wiz Kid routine I describe in the article. In 2007, I built a new model from scratch just for this e-Book and photographed the construction step by step. You'll need to be able to get the stuff shown in the photo above, plus, of course, hardboard, molding wood, nails, screws and glue. Tools required will be a drill, manual or electric, and a saw, manual or electric. Naturally, electric tools are best and make the work zip along. In the article, I will provide on-line sources for materials needed. This e-Book was sold for $20.00 in 2007, guaranteeing those who bought it at that time exclusive performing rights. They were told that in 5 years (April of 2012) the e-Book would once again go on sale for any and all magicians who wanted to purchase it, so they had five years exclusive use of the routines and props they built. Time's up! The e-Book has been on sale since April 1st, 2012. 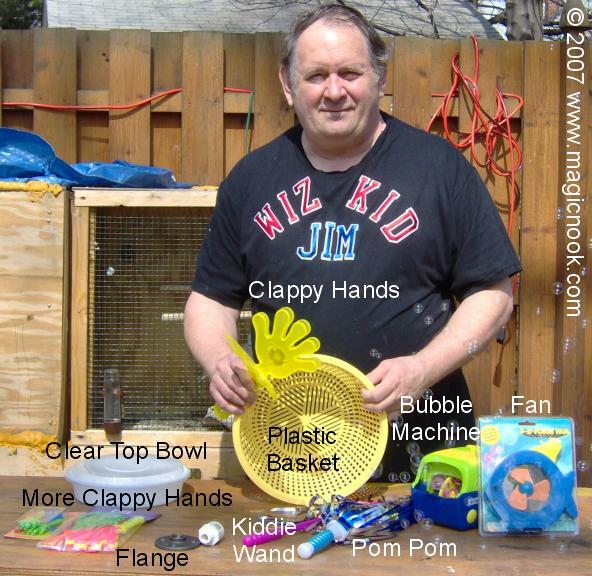 If you're not a kid show performer, DON'T buy this! This should ONLY be purchased by those with kid show experience who intend to build and USE it! 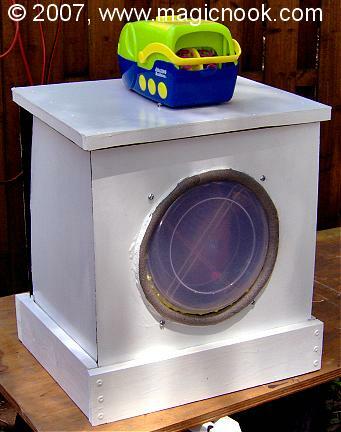 Added as a bonus: Jim's "Quick & Dirty Washer-In-A-Box" which is a smaller "parlor-sized" version of the same effect PLUS his Impromptu (almost) version where you transform an ordinary detergent box (from the Dollar Store, no doubt!) into a washer box right in front of the audience.